Now based in the Chicago area, Bigfat’s is named after a nickname Jeremy got from gaming online (I assure you neither he nor Kat are big or fat), and the whole series of hot sauces with the “o” in the middle is because Jeremy was 1 of 8 kids growing up in his house. It is indeed an “o” and not a zero “0” – and so begins the story of 1o8, 2o8, etc. As for the missing 7o8 and presumably a potential 9o8, Jeremy has clued me in to their plans, but I can’t reveal them until the end of this series of reviews. 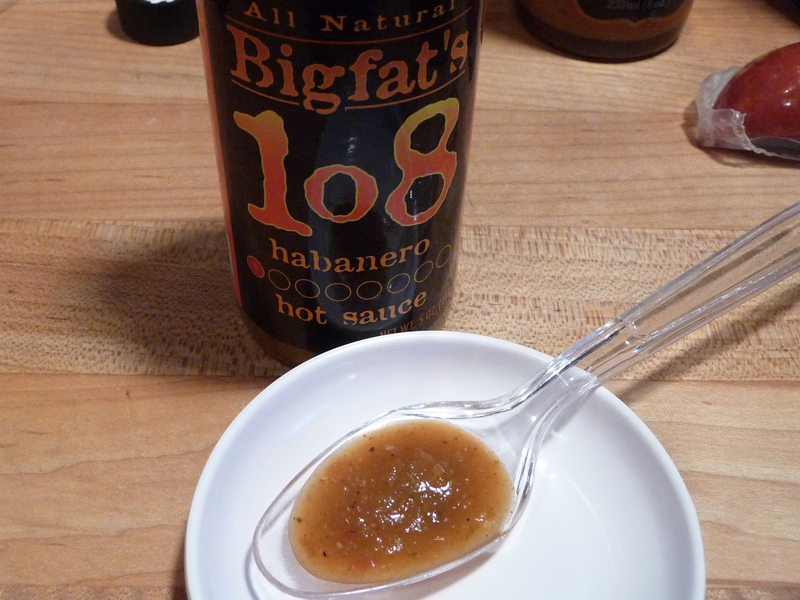 So let’s start at the beginning… Bigfat’s first sauce, their 1o8 Habanero hot sauce. Like the entire lineup, each label sports big, bold, free-hand style fonts and very simple graphics. They really stand out on a shelf. And a signature feature on the label is a series of 8 small circles, indicating the heat level, each filled in one by one as you go up in the numbered series. The 1o8 having just the first circle filled in, all the way up to all 8 circles filled in for the 8o8 version. Ingredients: onions, tomatoes, water, garlic, habanero peppers, basil, sea salt, lime juice concentrate, xanthan gum (thickener), ascorbic acid, spices. These are all natural sauces, with no artificial additives or preservatives. Each bottle includes the instructions: “Shake it, use it, love it, repeat” – a very cool Motto, and some confident advice. The aroma really brings a big hit of the fragrant basil, along with a fresh, citrusy smell thanks to the lime juice. I’ve said it before, and I’ll say it again, I am slowly becoming a big fan of habanero based sauces, due to the many, varied and creative ways manufacturers are coming up with more than just habanero, vinegar and salt. 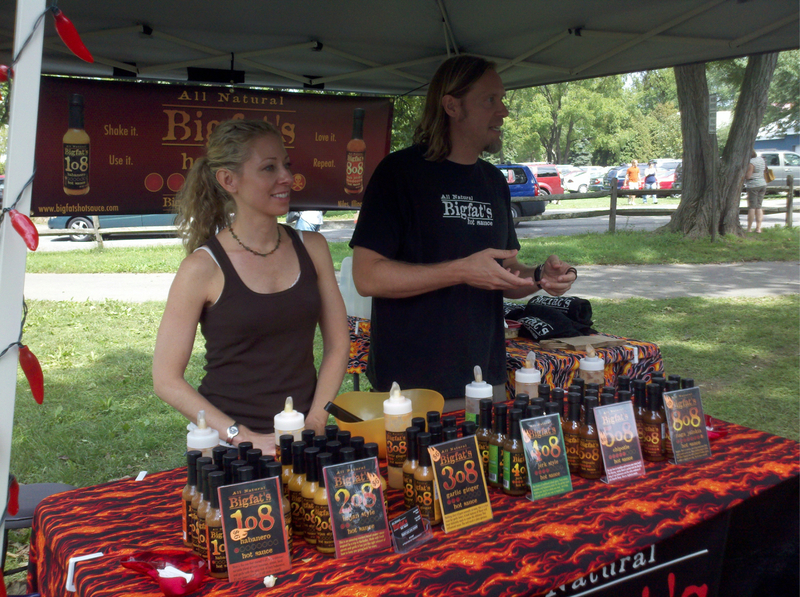 Bigfat’s 1o8 Habanero sauce is yet another habanero sauce that is raising the bar on flavor. 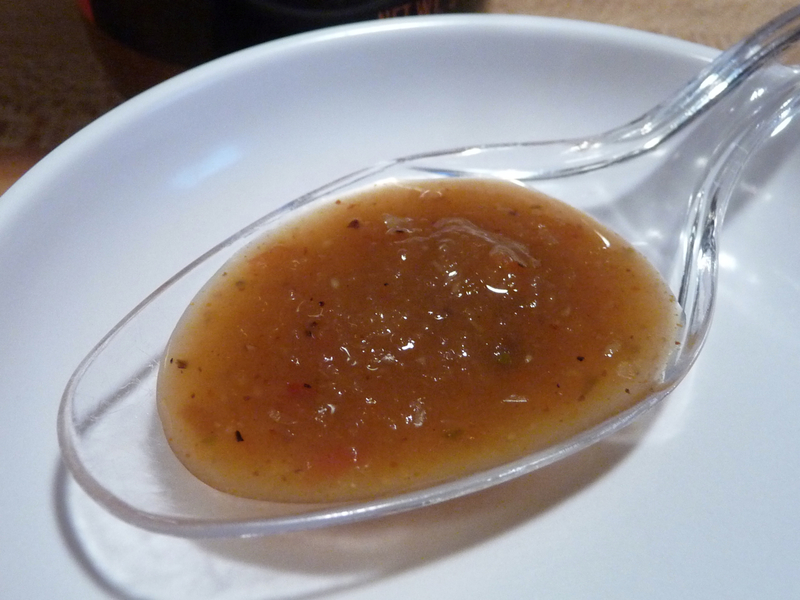 This slightly murky green colored habanero sauce has a big, bold flavor that includes some heat, as you would expect. While it is their mildest heat level, it still packs a little punch and therefore would be a great introduction to a habanero sauce for you more timid chileheads – or for those shopping for a gift for “Dad” or “Hubby” that still wants to impress, but not overdo it. 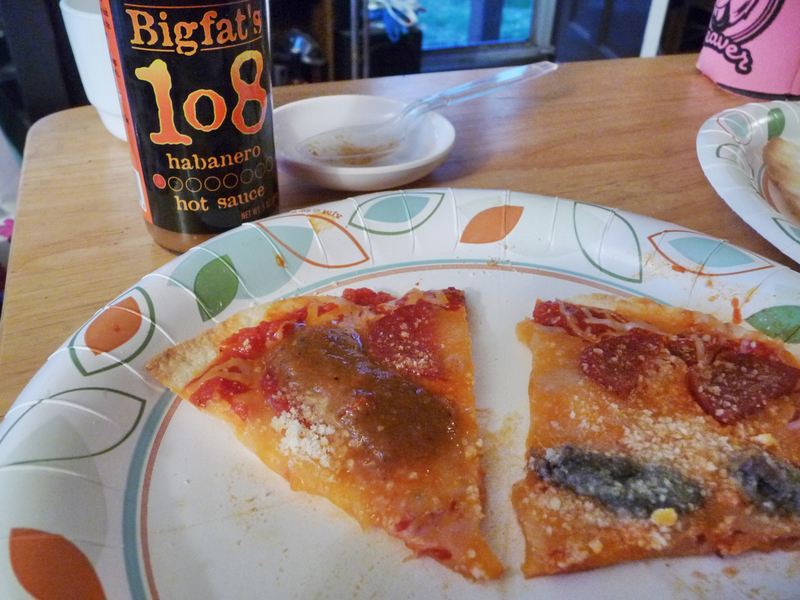 And this 1o8 sauce does indeed impress… it’s flavorful, got some heat, looks great, and tastes like the quality sauce that it is. We tried some on pita chips (homemade, fried, and lightly seasoned), as well as on the proverbial pizza slices. Yummy! (As I write this review, almost all of the bottle is gone). This would make for a great taco / burrito sauce as well. 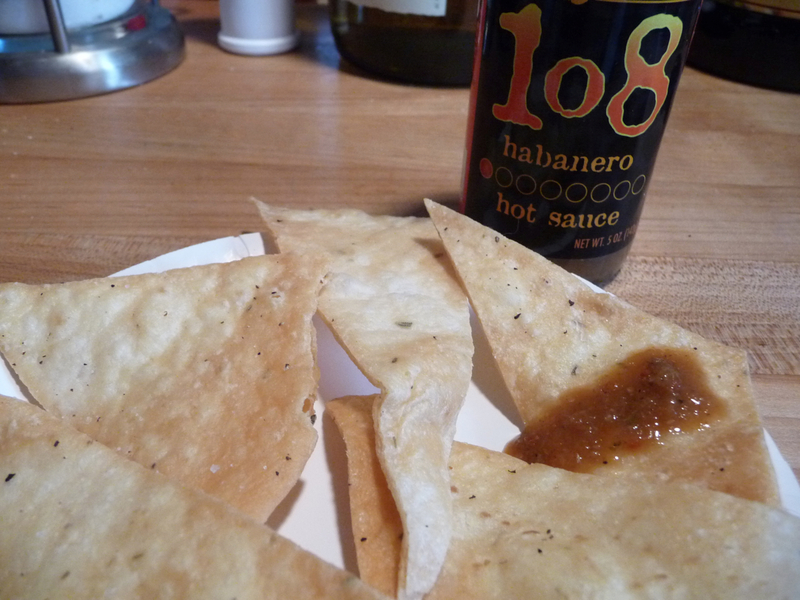 For you habanero fans, this is a delicious, low-level heat, habby sauce – great for beginners too. Heat Level: – a mild, 2 Star rating for heat. Very comfortable. Overall Rating: – for overall flavor and quality. You might also like to listen in to our podcast – HotSauceWeekly #53, where Jeremy and Kat were our guest interview. Good times! Visit BigfatsHotSauce.com and tell them HotSauceDaily sent you! Love this review. You really hit all the high points we want people to enjoy. Thanks SO much!!! That’s high praise coming from you Ed, as your Born to Hula labels are awesome too. Perhaps Jeremy will see your comment. The shot in the spoon really shows off the body of this sauce. It almost looks like a salsa verde. Loved the podcast! The labels are absolutely fantastic! Thanks David! I agree, Jeremy has got some awesome labels.